There are many reasons to create a card - like celebrating the end of the local recycle-truck drivers strike. During the strike I discovered that the dress from the just-released Lady Dancing Die Set 98394 is perfect for upcycling your lightweight sparkling water cans. It's not the first time anyone ever diecut metal cans...but these cans were just waiting for the perfect dress die to come along! I've used cans from Cascade Ice Citrus Twist, Pomegranate Mango and Lemon Lime flavors - from my Woodinville Top Foods - for this card. The tiny silvery ballet slippers were diecut from the barcode section of the can. The cans are great for diecutting birds, flowers and butterflies too...and they'd be cool for "green Christmas" ornaments. It's addictive once you get started - and you'll look at juice and water cans in a whole new way. Carefully trim the cans, then diecut the dresses from the beautiful graphics on the cans. Cut the shoes from the can's barcode section and attach them to the lady, cut from Parchment Cardstock. Stamp Distressed Garden Record G1848 on Mango Distressed Dots with Seattle Sky ColorBox Archival Dye Ink. Trim the cardstock and ink the edges with Seattle Sky. Diecut the letters to spell "choices" using the Parker Lower Alphabet 98363 set and Dill Cardstock. The letters can easily be separated for diecutting - but I'm keeping the set intact for now so I don't lose any letters. Attach the letters to a piece of Key Lime Cardstock. Attach everything to a 5.5" square card of Mango Cardstock using a combination of double-stick tape and foam dots for the lady and dresses. The natural curve of the metal adds a nice dimension to the dresses. 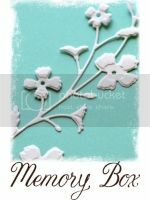 Memory Box stamps and dies, ColorBox inkpads - and the promise of Spring - inspired me to create a set of garden gift tags to tuck into a handy little tin from Basic Necessities by Clearsnap. Hop over to the Clearsnap Altered Basics Blog Hop on March 7th and 8th for great designer projects featuring the new line of fun, functional, alter-able items - and a chance to win great prizes! The new Memory Box stamps and dies, and a few old favorites, teamed up with ColorBox pigment, dye and chalk inkpads to create dreamy little tags in shades of green, violet and purple. Notecards in Violet (which look blue here, but are a beautiful rich bluish-purple in real life), Wisteria and Parsley were simply cut in half to create the tags, which fit perfectly in the tin. Attach a 3.5" square of Scor-Tape to a scrap of green cardstock and diecut Floral Square using the Metal Adapter Plate along with the plates used for thin metal dies. Carefully remove the liner. Spread a thin layer of Peridot Glitter on a non-stick surface (I used a cutting mat) and press the adhesive side onto the glitter. Using a soft rubber brayer (and cleaning the brayer with a damp washcloth between inks), layer Heliotrope, Citrine, Lilac and Lavender inks onto an 8.5" x 11" sheet white cardstock. (Yes, the combination of colors unexpectedly created some orangey sections - but I liked it!) Heat-set the inks with a dry iron on the cotton setting. Cut one 3-1/8" square of the inked cardstock and round the corners. Attach it to the tin, then attach the glittered diecut. Cut the remaining cardstock into 2-1/2" x 3" pieces and set them aside. Diecut Fringe Border, Small Pinwheel Posie and Fancy Blossoms from purple felt. Using tweezers or a chalking tool, roll the Fringe Border into a flower, secure the end, and glue it to the tin. Starting from the outer edge, loosely roll the Small Pinwheel Posie into a flower and attach it to the tin. Layer the three Fancy Blossoms. Attach Scor-Tape to a scrap of purple cardstock and brush Grape Fizz Glitter onto the adhesive. Punch it into 1/4" circles and attach the circles to the flowers. Trim the stamped cardstock and ink the edges using the Stylus, Tip and Grape Slushy. Cut Violet, Wisteria and Parsley Notecards into 2-3/4" x 3" folded tags. Attach the stamped pieces to the tags. Attach green, purple and light violet cords to the tags. Hope you liked the project - make a set of tags for yourself, and a few extras to share! Here's another Basic Necessities Tin project you might like.. And remember to hop over to Daniela's blog for another altered tin project, and an altered salt shaker idea too!